The hobby of quilting may experience rises and falls in popularity, but baby quilts are always considered a thoughtful, stylish gift. Hand piecing and tiny stitches have been challenged with machine quilting or tied quilts, but not replaced. There will always be quilting circles that enjoy not only the finished product, but the pleasure of gathering with other women to catch up news as well as the pride in the finished product. Patchwork crib quilts are desirable because they are beautiful and because the comfort of a cotton quilt is beyond compare. The ability to gauge the weight according to your personal needs with light, breathable cotton quilt batting for cool weather and warm, soft wool for cold nights will make bedtime something to look forward to. 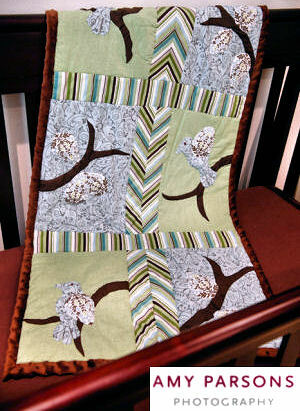 This crib quilt features a border sewed with striped fabric in a chevron design and sweet bird appliques. This quilt was a perfect match for the baby bedding set as it was sewn using leftover fabric scraps from the nursery's curtains. Are you looking for a free quilt pattern but can't find it on the web? Have you made a patchwork quilt that you would like to show off or do you have an etsy or ebay store where you sell crib quilts that you would like to promote? Upload quilt pictures or post a quilt pattern request in the form below that I have provided for that purpose. Have you got a picture of a homemade baby quilt or a favorite pattern that you would like to share? WHAT WE LOVE ABOUT THIS QUILT! Perfect Beginner pattern. A single Irish chain using solid blocks with Peter Rabbit and Beatrix Potter theme fabrics in the center block. The result is very vintage and dainty. Wild Monkey Theme Free Kids Quilt Pattern. The pattern is nothing unusual, but an excellent visual tutorial on how to mix and match fabric patterns. Quick and Easy Quilt as you go free baby quilt pattern. It's not fancy or very personalized, but if you need a free Quilt in a Day pattern, this easy quilt pattern might be for you. I would rather have a nice tied single or double chain, but if you like the Log Cabin style and like to use a serger send us a picture. Use these cute pictures to make baby quilts in themes. Cute free quilt patterns for dinosaur theme kids quilts. Dog shapes including French poodles, Scotty Dogs, dog houses and dog bones. Perfect for a puppy dog theme quilt. Everything for a wild western cowboy theme baby quilt pattern. As you can see, quick and easy appliques that a beginner can master make baby quilts perfect for lots of different baby nursery themes. A baby quilt makes a lovely gift and I would encourage you to try your hand at quilting your own using one of the free baby crib quilt patterns that I have in my list below. Buy some quilt fabric and try your hand at creating a precious keepsake. Handmade crib quilts make unique baby gifts that will truly shine at the baby shower. If you know the colors and pattern of your friend’s baby bedding set, a homemade crib quilt can be personalized not only with an embroidered name, date and perhaps a baby poem. 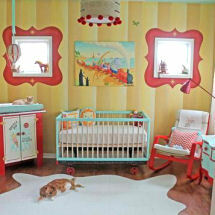 You can design your baby quilt to mimic the theme, color and style of decor in the nursery. The crib comforter probably won’t be tucked into baby’s memory box, but you can bet that your handmade crib quilt will have a special place of honor. You might wonder why in these days when modern decor is all the rage that moms don’t consider kids quilts old fashioned. The answer would be that quilters take pride in developing new quilt patterns in trendy, fashionable styles. Vintage, floral applique quilt patterns will always be popular, but there are just as many funky, bold quilts in bright colors in the frames as there are quilts based on antique patterns and designs of the past. We keep quilting those little quilts generation after generation because they are so very beautiful to see and so comforting to the touch. With some tweaking, we can adapt traditional quilt designs to blend with fashionable color schemes and styles of bedroom decor. By softening the color palette and adjusting the sizes, most any quilt design can be used for crib quilts. Feel free to tour our website where you will find many ideas for quilts that you can use to decorate a nursery for baby and tips on how to best display your baby quilts.